The Sicilians love their ricotta desserts and there are an abundance of variations of desserts using not only the ricotta, but also the chocolate and candied peel (for example cassata and cannoli). 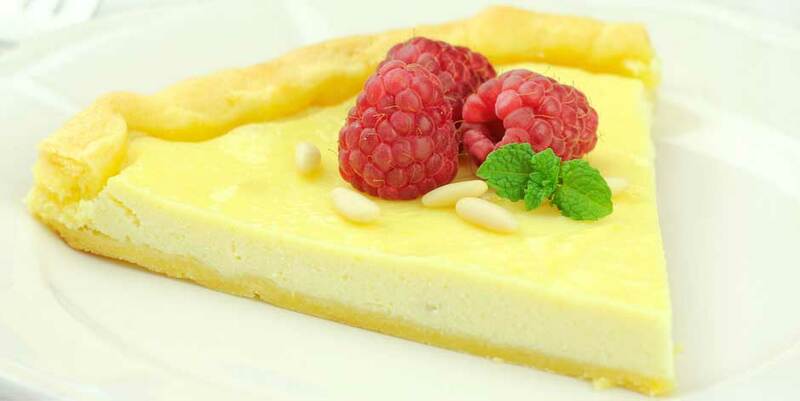 Often eaten around Easter, this tart is a fantastic dessert that will make your Easter Monday taste even sweeter! Sieve the flour, sugar and salt together and add the butter (cut into small pieces) and mix with your fingertips until the texture is like breadcrumbs. Add the sherry and lightly mix to form a dough. Cover and put in the fridge for at least an hour. Chop the candied peel and chocolate into very small pieces. Beat the egg yolks with the sugar until creamy and then add the chopped lemon zest. Then beat the ricotta until light and add to the egg mixture. Finally add in the candied peel. Preheat the oven to 190 degrees. Roll out the pastry and line the bottom and sides of a cake tin with three quarters of the pastry. Pour in the ricotta mixture and spread it evenly. Roll out the remaining pastry and cut into strips that are about 2cm wide and make a lattice on top of the tart. Put in the oven and bake until the top starts to brown, about 30-40 minutes. Allow the tart to cool before serving, it is best served cold. This Sicilian Ricotta Tart is delicious served with a strong Italian coffee and is a great example of Sicily’s wonderful desserts! For more Sicilian recipes, why not join us on our cookery holidays this spring? You can check dates & availability here or simply contact a member of our travel team today!